Life is busy. I don’t coupon. Maybe I should, however I do a lot of my shopping at Aldi (a discount grocer), so I guess I’m not as motivated as some. I feel like I’m already getting things at about half price. But, when a deal smacks me in the face, I am wise enough to engage! Such was the case the other day! The best part about getting groceries that day at Target was that most of what I purchased was on sale as well. For instance, the Folgers coffee was $6.99 each, which is an awesome deal for a big container! It’s double that price at the regular grocery store around here. I bought two. Should’ve bought more in hindsight. Anyway, I got some lunch meat and some other necessary things. The icing on the cake was the fact that I also had a $5 gift card from the last visit when I bought 3 sets of Suave Naturals mint shampoo and conditioner. If you bought 3 sets, you got the $5 gift card. They were $3.87 per set, which was pretty good. Not great, but pretty good. I just saw them at another store for $2.50 each, which is normally what they run for. 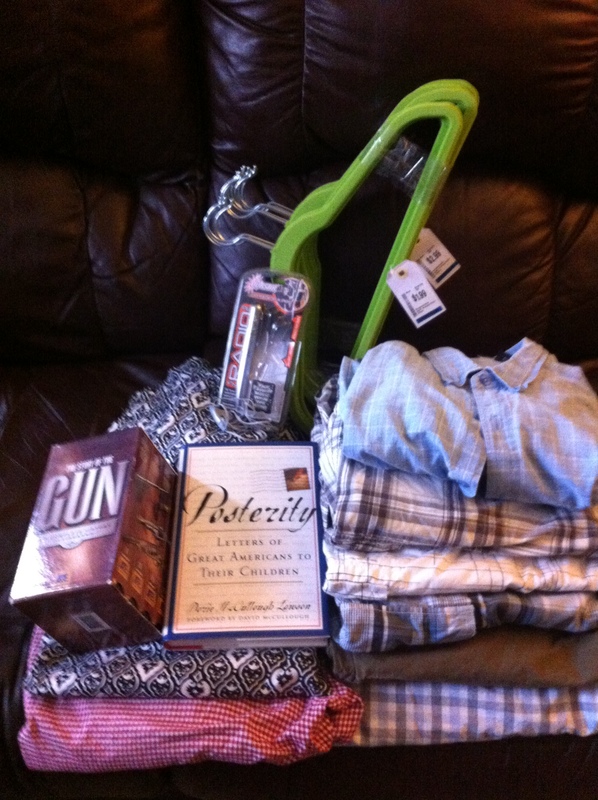 So, to get the gift card on top of that was pretty decent. So, my grand total of savings on this Target shopping day was $15 plus the difference between the sale items vs. regular price. (which I didn’t tally up) Not bad for a non-coupon clipping lady! (not to mention, a limited-techy lady) I just love when I stumble upon an amazing deal! Thank you, Lord!! Frugal living does not necessarily mean a life of total sacrifice. It, conversely, has more to do with saving money where you can so you are free to spend money on the important, quality things of life. So, that’s our mode of operation in general. It’s all about intentional living … Redirecting our money away from useless, fleeting expenditures (like Starbucks coffees, pedicures, fine dining, etc.) and toward the things that strongly matter to us. Choices. All about choices. Yesterday we dropped our 2002 Toyota Sequoia off at the dealership to have the oil changed and fluids topped off. And today they called us with the ugly news! It seems our twelve year old SUV is in dire need of front and rear brakes, new rotors and a fresh air filter. *Sigh* The ugliness of it all is to the tune of $1,400! Ouch! It would seem our money tree out back is bare at the moment, so my husband has a better idea than to line the dealership’s pockets. Our good neighbor is a Toyota mechanic so we’re going to see if he can help us out. He also happens to be a Christian and we like their family a great deal, so prayerfully it works out. He often does work on the side. We figure between the cost of the parts and labor, we’ll likely save half. That’s frugality put into practice. Not to mention, the last three months of electric bills were: $718, $597 and $565! And, now this … Ugh. It’s a good thing we have no car payments! I’m so thankful that old man winter has had his run for this year and we are slowly marching into spring weather! (which means lower electric bills!! Praise the Lord!) Also, our electric bill will be lower anyway due to recent repairs and freon being added, thankfully! Today I went to the discount grocery store we usually do a fair amount of our shopping in and reflected on the $86 well spent! I stocked up on a ton of fruits, vegetables, and a lot of things. At the regular grocery store, it would’ve been more than double that price! So, we save where we can, like I said. Oh, and I was so excited to use my $5 off coupon at Target this evening (if you spent $35 or more)! Not bad considering I’m not much of a couponer. Also in the mix is our desire to do a few household projects, but we’ll see about those. I cannot complain really. We are so very blessed. God is always so faithful to us and has never failed to provide for our every need! We are firm believers in tithing and offerings. One thing I’ve learned over the years is that you can’t outgive God! He owns everything, afterall. It’s all His. He gives us the ability to work and earn a living, and blesses us on top of that! What a kind and loving God we serve. May we be wise and faithful stewards of all that God has entrusted us with! When unexpected expenses arise it reminds us once again of the importance of an emergency fund and savings. Like I’ve told my daughter, you will never be sorry for saving too much money! So, here’s to increased savings! We mainly went to look for summer clothes for my son, but also to use the 30% off coupon I had. 🙂 All of the shorts were name brand, such as: American Eagle, Polo, Aeropostle, Arizona, etc. I absolutely love the huggable hangers (as seen on HSN)! They are tremendous space savers, in addition to ensuring clothing doesn’t land on the floor. I’ve bought several sets over the years, so I was thrilled to find the “like new” set of 18 today! If they were grungy, I wouldn’t have been tempted, but they are in mint condition. All in all, a good treasure hunt! That’s the interesting thing about the thrift store. You never know what you may find. I’ve shopped at this particular one for a long time and have gotten some amazing deals. We also dropped off two large bags of donations as well as the bags from my Dad’s recent purging. So, our trip was dual purpose. Ironically, we donated two sets of VHS tape series … and we brought home another! I guess you can’t go too wrong for a couple dollars. Haha. Thrift store prices vary from area to area. As I’ve previously mentioned, we live in a high cost of living area, so these prices are pretty good. I’ve been to some thrift stores that have a $.99 bin for clothing, which is usually the last step before the trash; but $.99 cent clothing is not to be had around here. You might be able to find a t-shirt for that price, but that’s about it. Considering a pair of shorts at Target or a department store runs about $20-$25 a pair, I’m pretty satisfied with paying $3 a pair! 6pm.com not only sells shoes, but clothing and accessories. I’m most impressed with their shoe prices. I detest paying full price for anything, especially for items my son will quickly outgrow! It seems that clothes and shoes are merely disposable items these days, so why pay more when it’s unnecessary? My lovely sister-in-love told me about that website a while back and I’m so glad she did! She’s a savvy bargain hunter herself! So, I just thought I’d toss it out to you all. Here’s to saving a few $$ today! Do you have a favorite $ saving website? Care to share? Of course, there’s ebay, Amazon, half… What else? I got tired of the pens and pencils rolling around in the drawer of this side table, so I went dumpster diving in our recycling box. No worries, the boxes were clean. They are both Ziploc boxes that I cut out one side and taped together to form a tray. Remember my sock drawer overhaul? Well, this is very similar. Look out now! No drawer in my house is safe! Have tape … will craft! I did have to trim about a half inch around the perimeter as the box was too tall for this shallow drawer, but that wasn’t difficult. Then I just taped around it for reinforcement. 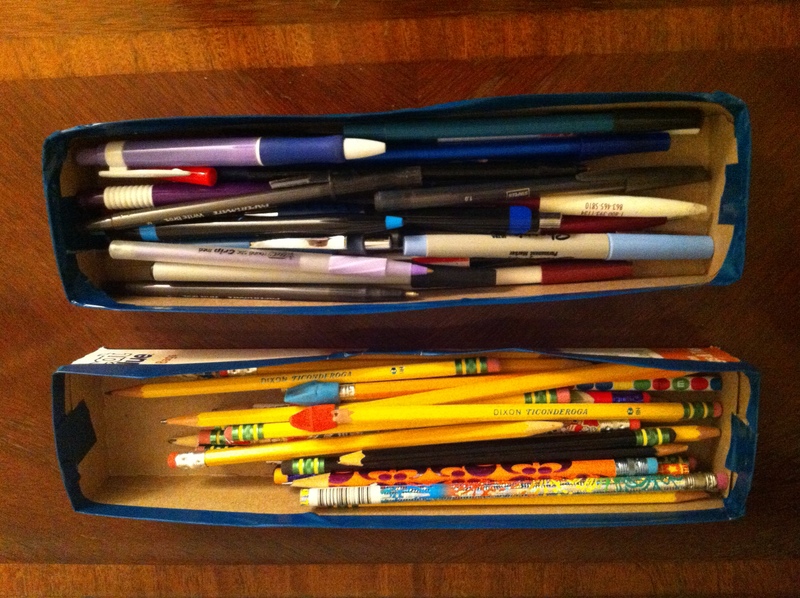 As you can see, I separated the pens and pencils, so we can quickly retrieve what we’re looking for. 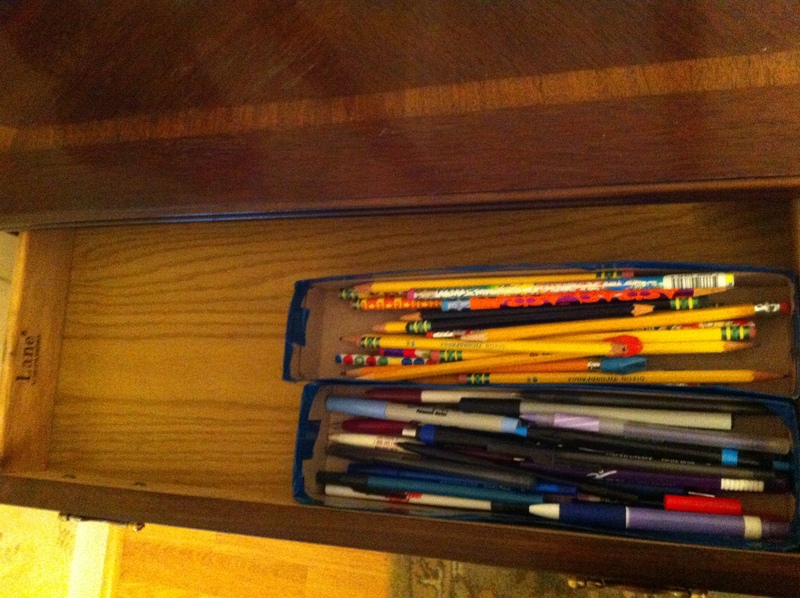 How is it that so many pens find their way into our home? I haven’t had to purchase any in forever! So, I figure the little organizers are $1 at the dollar store, which means I saved $2 today by using supplies I had on hand and a little ingenuity! The credit for this savings goes, first of all, to God, who gives us favor at every turn! Secondly, to my husband, whose middle name is “Master Negotiator”! Yes, he has two middle names because he’s so special! Haha. Sears came out this evening to repair it and initially, the guy quoted the repair at $665! Ouch! Talk about unexpected! I prayed that the Lord would give us favor and help us with this expense. We’ve been hit with back to back electric bills of $718 amd $596! We have a budget, but it has been severely tested this year already. Anyway, thankfully, my husband got home in time to speak with the repairman just as he was quoting me the price. I don’t know how he does it, but I know we never, ever pay full price for anything! He’s incredible. He got the guy down to $450 out the door! There’s our savings of $215! Thank you, Lord! So, yes, we saved $217 today! My little craft project only saved $2 and, yes, I could have easily gone to the dollar store and purchased the needed supplies. But, why do that? I was actually tickled with myself that I came up with this handy, little tray. It should hold up for quite a while and when it decides to tear, I’m certain we’ll have another box I can craft a replacement out of. What if I don’t buy this? Can I make something similar? Can I delay this purchase? If I must purchase, do the homework to ensure the lowest price possible. Saving $2 seems rather trivial, but, what if I saved $2 every day? Sometimes it’s the small habits that can snowball into larger ones. Before you know it, you’re more creative than you ever dreamed was possible and the savings just follow as a natural occurrence. What is your favorite frugal habit? I popped into Target yesterday afternoon for a few groceries and noticed they had a good bit of items marked down on clearance. Those nifty little red tags always vie for my attention! Sometimes they are good deals, sometimes fair and sometimes a definite pass. 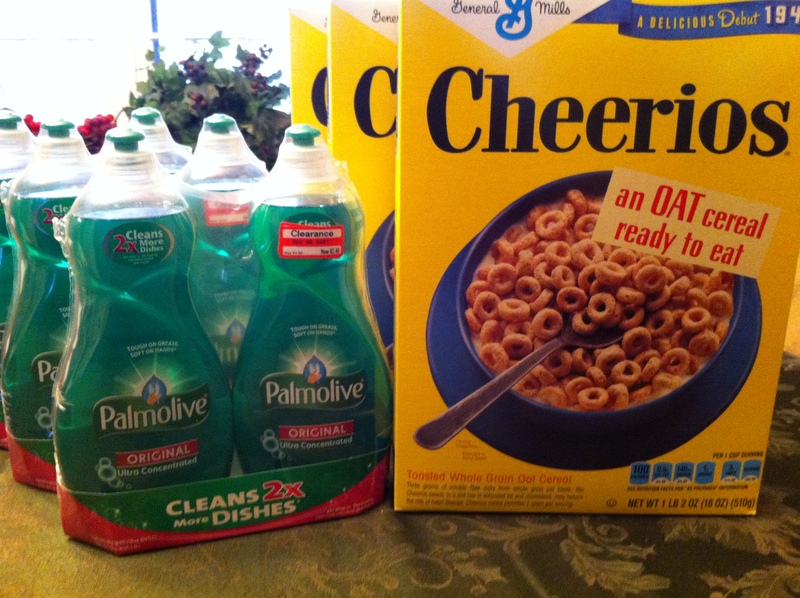 The large boxes of Cheerios were not on clearance, but on sale for $2.50 each, which is pretty good. Three seemed like a good number to me yesterday for some strange reason. I love Cheerios. It’s a strange addiction, but fairly harmless, nonetheless. Target also had a bunch of laundry detergent on clearance. If I were in the market for some, I would have picked that up as well. We make our own laundry detergent primarily. Toward the end of last year, I broke down and bought a large container of Tide pods, which I love. We are still working on that, amazingly enough. I also do my dad’s laundry, so that is doing pretty well. If I had coupons to stack with those sale items, that would have been even better. I wanted to share these deals with you to let you know to keep an eye out for those nifty red clearance tags if you shop at Target. As seasons begin to change, they generally mark more things down, I’ve noticed. Just because an item sports a nifty red clearance tag, does not mean it is a good price or that it is imperative that I take it home with me. You have to know your prices. And we must ask ourselves whether we really need the item or not. I’m finding myself becoming increasingly more selective when making purchases. It’s not so much because of the price always, but I have this inner debate whether or not there is a purpose to my spending. Sometimes I think we buy on impulse, out of habit or because of a perceived future need. ‘Well, maybe one day we may need that item.’ Meanwhile, it collects dust and consumes mental space. And if you watch t.v., be aware of the effect that commercials may have on you. I don’t watch t.v., but my 14 year old son finds himself repeating commercial jingles all the time. It worked! The advertising company succeeded in brainwashing my son that he needs the new Swiffer or car insurance or whatever it is! Say no to these subliminal messages whose only goal is to take your money to line their pockets. No thanks! I got a few things from the dollar store yesterday: a gift bag, spray bottle (for my homemade Pledge spray), two toothbrushes and some bobby pins for my daughter. I tried to find other things to buy, which is silly, isn’t it? I guess I say that because I was looking for “deals”, but that’s all I found of interest (or need). It’s a great place to find plastic bins for organizing. Much of their merchandise hails from China, thus I would not purchase food or candy. (Remember the toothpaste & dog food scandal?) And the candy is likely stale even if it’s not imported. I’ll pass. The quality isn’t there for most items. I’d rather spend a little more for something that will last in general. It is good for one use items. Because that’s probably as long as they will last anyway. I can usually find items on clearance for equal or lower prices for better quality and name brand. When I travel to an economically depressed area of town, I always notice their gas prices are vastly inflated compared to my local gas station. This isn’t limited to just one part of town. There are other economically depressed parts and it’s the exact same scenario repeated. Why do you think this is? Isn’t it sad that proprietors prey on the ignorance of their customers? Yes. Such is life, however sad. It’s the same way with the dollar store or many other venues. You have to know your prices! It’s that way with car insurance. I shared this in a previous frugal post (“Budget $aving$” on 2/2/14), but when we switched car insurance companies last fall, we wound up saving $1,500. I knew we were overpaying! Insurance is definitely a budget area that necessitates annual review for optimum savings. Prices fluctuate all the time. Companies will charge what their consumers are willing to pay! That’s the bottom line. Be an informed consumer and you will save $$ every time!